Until recent events proved otherwise, the hyper-commercialized surface of the corporate state gave the appearance of being too diffuse--too devoid of a center to pose a threat of totalitarian excess. Accordingly, as of late, due to the violent response to OWS protesters by local police departments in Oakland, Atlanta, Chicago, and in other U.S. cities, the repressive nature of the faux republic is beginning to be revealed. Behind the bland face of the political establishment (purchased by the bloated profits of the plundering class) are riot cops, outfitted and armed with the accoutrements of oppression, who are ready and willing to enforce the dictates of the elitist beneficiaries of the degraded status quo. In deed and action, as of late, the police state embedded within neo-liberal economic oligarchy is showing its hyper-authoritarian proclivities to the world. In general, existence within the present societal structure inflicts on the individual a sense of atomization and its concomitant feelings of alienation, vague unease, free floating anxiety and anomie. The coercion is implicit and internalized. Because of its mundane, ubiquitous nature, the system is reliant on an individual's sense of isolation (even ignorance of the existence of the structure itself) to remain in place. In short, the exploitive system continues to exist because its denizens are bereft of other models of comparison. On Tuesday Oct. 25, 2011, the Oakland Tribune reported that police raided and demolished the local OWS encampment after declaring the area a “crime scene”. This is revelatory regarding the character of the enforcers of the present order: Those in positions of power within a police state view freedom of assembly and freedom of expression as a punishable offense. It is a given that: Authoritarian personality types take particular umbrage when citizens are expressing their displeasure with official abuses of power and begin to do so in an effective manner. Too many in the U.S. have bought the fiction that the nation was, is and will remain a democratic republic. Therefore, by drawing its brutal operatives and mendacious apologist into the open, the state will reveal itself in all its ugliness. As a result, all concerned will be able to observe the true nature of the police/national security/oligarchic state in place in the U.S. Ideally, few illusions will remain intact regarding the ruthless, brutal forces against which we struggle. Moreover, the actions of the police in regard to public protest are premeditated tactics aimed at the suppression of the right to public assembly. The goal of the power brokers, their political operatives and police enforcers is to render one's (allegedly) constitutionally guaranteed right to dissent too prohibitive to be practiced. The economically dispossessed and members of minority communities have known for many years what OWSers are suffering, presently, at the hands of official power and its enforcers. In turn, individual police officers are well aware of whom they are sworn to protect (and it isn't those who desire to exercise their rights to free assembly and free speech). In most cases, if an individual police officer ever refused an order to make an unconstitutional arrest, he/she would be committing an act of careercide; their chance of advancement within the department would have to be scraped off the sidewalk on the spot and transported to the city morgue. Are you willing to leave the confines of your comfort zone and go to jail for justice? Rarely, does reform arrive without the arrest of frontline agitators. Power does not yield without a fight, without attempting to silence dissent by brutality and forced detention. The powerful demand that those of us who notice their excesses and crimes be placed out of sight and out of mind. Hence, in Oakland, the local corporate news affiliates, to their shame, turned off their cameras when the violent attacks and mass arrest of protesters began. Are you willing to risk injury to body and reputation to bear witness? 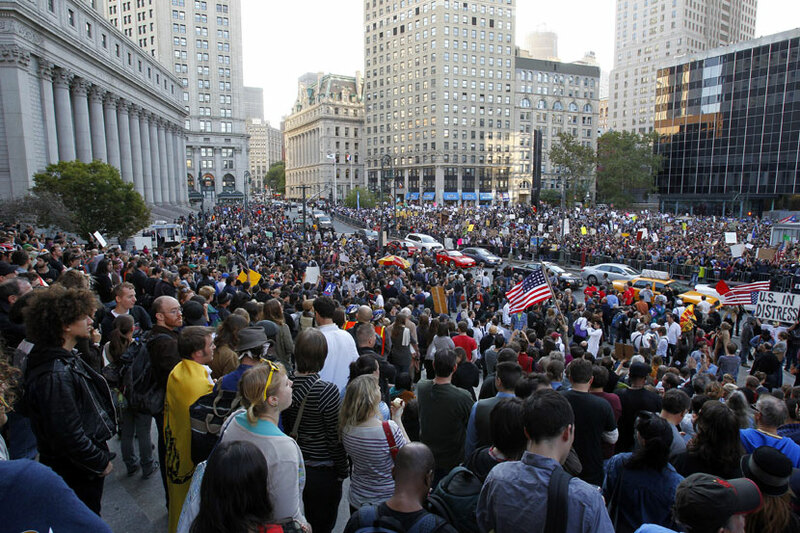 The survival of the OWS movement depends on having bodies on the ground and eyes (as well as cameras) on the thugs in uniform. True to form, a servile corporate media will proclaim how unsightly dissenters are, inferring that sensible folk, simply as a matter of good taste and public propriety should disregard the protesters’ entreaties and that these malcontents and cranks should be denied entrance into the realm of legitimate discourse, that these disheveled interlopers be barred by walls of silence. To be in the world is to be confronted with walls. How we respond to these barriers is called character and art. Many brave souls have confronted walls such as these. Often, as I gaze upon the blue wall of mindless repression surrounding Zuccotti Park and reflect on other OWS sites nationwide, I am induced to feel the sadness and longing of the repressed souls of the earth, of those throughout time who have met walls of blind hatred, of economic exploitation, of institutional repression…. I empathize with all of those who faced walls of smug indifference, walls of internalized shame and walls of official lies--those who stood powerless before the stark reality of seemingly implacable circumstances. I reflect upon the lives and work of itinerate blues musicians of the U.S. Deep South and the manner they met walls of both official repression and collective blind, ignorant fear and hatred, and how they transformed those prison walls into the numinous architecture of The Blues…How they alchemicalized the barriers into guitar technique. Musical instruments, like word meeting meter to a poet, serve as both barrier and salvation; the limits of the self are tested, explored, and by effort, failure and moments of elation are transformed by confrontation and union with the instrument, personal circumstance and audience. As is the case with those on the front lines of OWS encampments, millions of people throughout history have met seemingly implacable barriers in the form of walls of human brutality e.g., Jim Crow laws, union busting management goon squads, the Zionist apartheid wall, various secret police and public bullies--but they weren't going to let the bastards "turn them 'round…"
If you choose to resist entrenched power, when confronted by mindless authority, your heart will know the drill; it will guide you--its natural trajectory is towards freedom. Hence, you will know what to do when the moment arrives--and will gain the knowledge that your predecessors discovered in their struggle for justice…that the cry arose forth from deep in their souls, "We shall not be moved." The practitioners of the Delta Blues came upon walls of oppression…walls of raging hatred, and responded by passing through those walls…to inhabit a landscape more alive, more resonant, more ensouled than their oppressors will ever know possible. They occupied their own hearts and draw us still into the immediacy of the world by their victory over their degraded circumstances by their appropriating the very barriers that were placed in their path by their oppressors and transforming the criteria of their oppression into the living architecture of the soul. Those who know this--have already won…have already overcome. Lorca limned the situation (one extant as well in the enfolding OWSmovement) in his theory of "the duende". His concept of the duende reveals why people, when faced by the ossified order of an inhuman system, either become caught up--even compelled--by the challenge to begin to make the world anew--while others are seized with mortification, indifference, resignation and hostility. In which direction does your soul wend? "The arrival of the duende always presupposes a transformation on every plane. It produces a feeling of totally unedited freshness. It bears the quality of a newly created rose, of a miracle that produces an almost religious enthusiasm." -- from The Havana Lectures, Federico Garcia Lorca. When I witness police harassing, arresting and brutalizing those exercising their rights to free assembly, I find myself gripped by a surge of rage…The rage rises in me in an animalistic fury--an urge to fight tooth and nail, to tear at the throats of these vicious intruders into the territory of authentic social discourse. As of late, instead of pushing down the fury rising from within me or acting upon it, I let it inundate my being. As a result, the coursing rage transforms into a penetrating, powerful force--enveloping and demarcating the geography of my convictions…arriving to bring acceptance and to define and defend the contours of my true self. Rage can appear as an angel of self-definition, the protector of one's authentic nature and a source of personal power…"ain't gonna let nobody turn me around, turn me 'round …"
One's anger is vital to one's existence; it is a valuable gift; therefore, it should not be squandered…no need to waste it on fools and idiots. When rage arrives, invite him in; his presence will fill the room with alacrity, and his surging vitality will allow you to push farther and deeper into the unexplored regions of your soul. I once saw a Great Dane on Second Avenue attempt to engage in canine communion with his fellows. In order to display his intentions were benign, friendly, he crouched down on the sidewalk, making his massive frame as small as possible, even placing his large head on the concrete…doing all he could to produce the artifice of submission, to even the smallest dog that approached him. In other words, to enlarge his world he created the illusion of smallness. He did not reduce his essence; he created the artifice of smallness so he could grow larger than himself by his union with the otherness of the world. We are not requestingthat cops crouch before us. They just need not bristle so. To grow in each other's presence, we are required to meet the other at eye level, even if one has to descend a bit from a habitual position of power and authority. Officers, your guns, rubber bullets, nightsticks, pepper spray--the looming wall of blue intimidation that you brandish merely creates the illusion of strength. If you truly want to grow strong, meet us on these sidewalks, sans the display of empty power. Phil Rockstroh is a poet, lyricist and philosopher bard living in New York City. He may be contacted at: phil@philrockstroh.com. Visit Phil'swebsite or at FaceBook.